The third and final post in our series What’s In the Alvastra Box reveals the secrets of the pottery sherds that were found during the excavation of the box. The primary question that drove our curiosity in the first place was whether or not the pottery in the box could be remnant pieces of the already reconstructed vessel that was discussed in the previous post A fragmented whole. My conclusion is that these sherds are probably not a part of that particular vessel, however they are very similar. Since the excavation I have studied the sherds in more detail. These studies have been rewarding and very interesting as the material is composed of a number of sherds that fit together, something that is very unusual. The sherds represent different parts of the vessel including the rim (B), the neck (B and C), the shoulder (C and D) and parts of the vessel body. No base fragments from this particular vessel have been found. The absence of base fragments was expected, yet a bit disappointing of course, since base fragments are so rare at this particular site. Nonetheless, a large portion of the vessel was preserved and the fact that the sherds fit together has given more insight to the pile dwelling pottery material as a whole: what it looked like and how it was constructed. 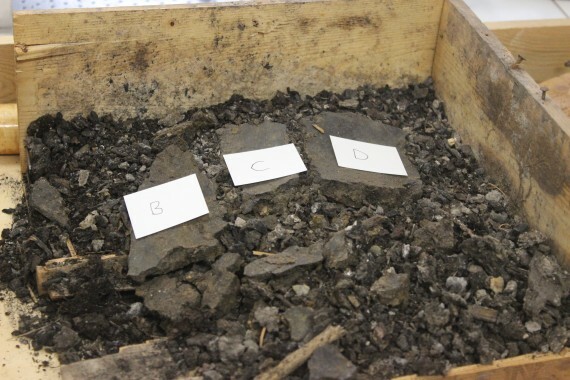 Three of the excavated sherds in situ. The rim (B), the neck (C) and the body (D). 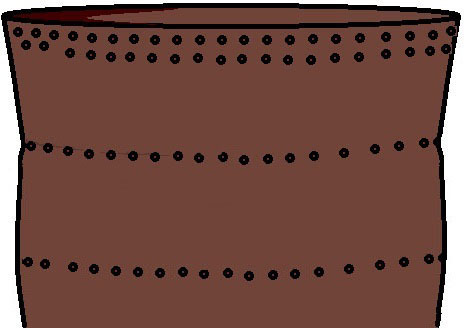 The Alvastra box-vessel is decorated with shallow, round pits (V2) applied in two rows directly under the rim. The second row is somewhat disrupted and applied in a zig-zag pattern towards the edge of the sherd and it is therefore hard to follow. A third row of pits was applied on the slightly profiled shoulder and a fourth and final row of pits was applied on the body. The fourth row of pits are of special interest here since decorative elements on the vessel bodies from the pile dwelling have not been described in the literature before (see Hulthén 1998:23, 39; Browall 2011:289). However, Browall 2011 mentions that V2 can be applied irregularly on the vessel wall (Browall 2011:261). The ceramic material found in the pile dwelling is very fragmented and spread out in the cultural layers and it is therefore very difficult to ascertain from what part of the vessel the different sherds originally come from, and that is one of the reasons why the new material is so interesting. A stylized sketch of how the Alvastra box-vessel is interpreted through the analysis of the excavated sherds. Illustrations made by the author. Furthermore, the vessel was to a large extent constructed by means of the n-technique, except for the shoulder of the vessel that connects to the neck with a typical u-technique join – a dimension of the manufacturing technique of the pile dwelling pottery that would have been difficult to understand without the unearthing of this vessel. The difference between the reconstructed vessel and the Alvastra box-vessel has to do with the décor. The reconstructed vessel in the storerooms was decorated with irregular rounded imprints V4 (Browall 2011:263) and the Alvastra box material with shallow pits V2. However, the biggest difference between the vessels lies in how the décor was applied. The reconstructed vessel has two rows of pits under the rim and two rows on the shoulder. However, the Alvastra box-vessel has two rows of pits under the rim, one row on the shoulder and a fourth row on the body. It should be mentioned that a third sherd was found in 1930, also decorated with pits but applied differently (FID508144, Browall 2011:262). This brings me to the conclusion that there are three pile dwelling pottery vessels within the same context (square C 9). They are decorated slightly differently but within the same ceramic tradition. The unearthing of the Alvastra box-vessel has given us some new insight into the material – how the decorative elements were applied, how the vessels were constructed and to some degree how the material was dispersed within the platform. Nice! what about the ware - asks the Mentor? Thank you for your question. It is a good question highlighting important information that I should have included in the latest post about the pottery that we found in the Alvastra box. All of the sherds found in the box are classified as pile dwelling pottery. The sherds are tempered with so called crushed rock (swe. krossad bergart) i.e. the temper is not rounded. The maximum grain size of the temper ranges between 3-8mm.